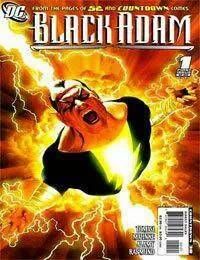 Spinning out of the weekly series 52 comes an epic 8-issue mini-series that follows Black Adam, the new über-villain of the DCU!<br />With the power of the gods stripped from him, Teth-Adam is on a quest to find not only the magical word that will restore him as Black Adam, but also the one thing that always kept his heart from turning completely black with rage.<br />Black Adam is a man responsible for the deaths of thousands of Bialyan citizens and wide spread destruction across the globe. He is a man on the run from Earths heroes, who want to see him brought to justice. Some want him tried before a world court, while others want retribution; to exact a pound of flesh for the lives he has snuffed out. And some simply want him dead as quickly and as quietly as possible.